Lough Neagh Partnership has launched the ‘Saving Nature Around Lough Neagh’ project to conserve the Curlew. 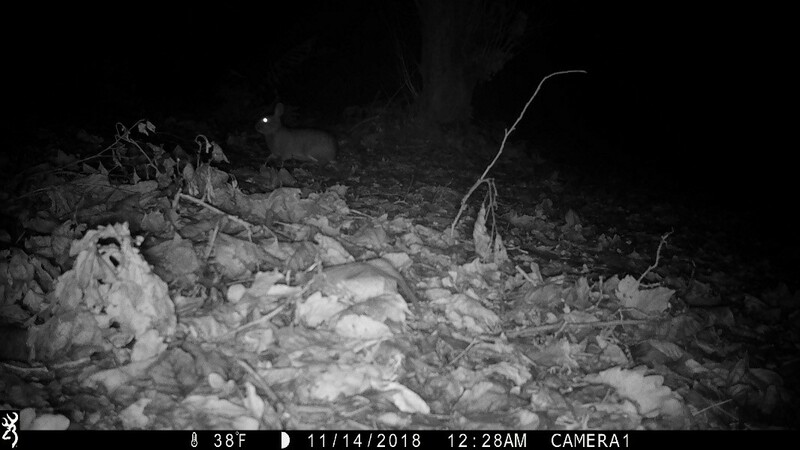 This iconic species has declined by 96% within the last ten years and the team is working with local communities to ensure it remains part of the Lough Neagh landscape. 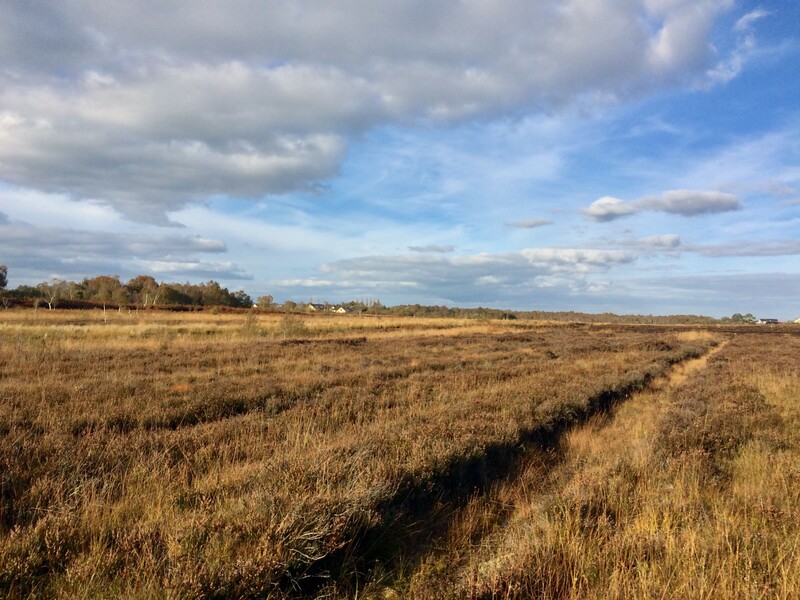 The project also aims to restore peatland habitat and wet grassland for birds, breeding waders, over wintering birds and other wildlife that live alongside the community in and around the Lough Neagh shoreline. The project is focused on South West Lough Neagh on the area known as “Department of Education” lands and will deliver conservation of the Curlew through practical works such as restoration of its habitat and working with local landowners and farmers to support Curlew using their lands. This will be delivered alongside more community focused elements such as improving the recreation and access through the lands for locals and the collection of local histories and memories through workshops which will be delivered this summer. Lough Neagh Partnership and partners have identified the monitoring of the breeding Curlew population in the area as being an integral part of the Saving Nature Around Lough Neagh project. Ornithologists from KRC Ecology will help increase the understanding of how the Curlew is using the area to build a positive profile for them. This work will then contribute to management plans Lough Neagh Partnership will develop to conserve the Curlew in the future. The partnership is seeking to involve local people and communities through a series of workshops and art engagements to afford local people the opportunity to voice what they would like to happen with the lands and how they would like to be involved in this. A summary document will be delivered in Autumn 2019 reflecting the outcome and this, and the works Lough Neagh Partnership will do with landowners and farmers through the Lough Neagh Environmental Farm Scheme, which has just opened its third tranche offering financial incentives for breeding waders and other habitat works, will help conserve Curlew and other priority species around the Lough. 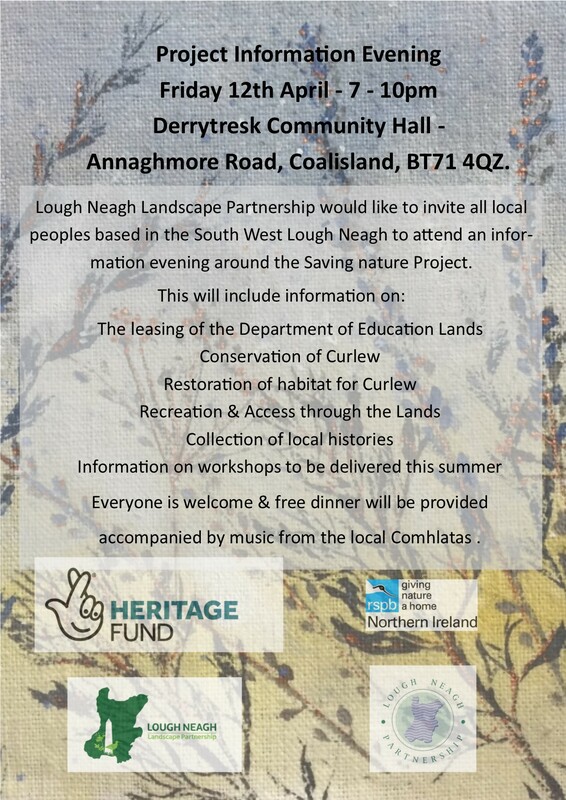 Lough Neagh Partnership will represent the local community’s perspective by exploring the relationship that exists between the people and their landscape, collecting stories and memories that local people have of the Curlew and other breeding waders that use the landscape. These bogs have been part of the consciousness of the landscape for centuries and stories from locals may include memories of family days out, Corncrake calling or reflections of cutting turf. This will result in a sense of empowerment for those who have clearly expressed their wants and needs. The engagements will be delivered by the team at Quarto who have delivered previous projects exploring community connecting with nature and how this can result in a sustainable healthy landscape. The workshops delivered by Quarto will focus on adults in the community and local children will have the opportunity to voice their thoughts and opinions through working with Rosalind Lowry on art pieces. It is envisaged that the Saving Nature Around Lough Neagh project will take two years to complete and it is being made possible through Lough Neagh Partnership’s Heritage Lottery funded Landscape Programme. Further information on the Environmental Farm Scheme which is open for application until the beginning of May is available at https://www.daera-ni.gov.uk/articles/environmental-farming-scheme-efs-higher-level or by calling the EFS Advisory Service on tel 0300 200 7848. For all queries, please contact Siobhan Thompson. A public art sculpture will also be created which is being funded by Antrim and Newtownabbey Borough Council and the National Lottery Heritage Fund through the Lough Neagh Landscape Partnership Scheme. It is important to ensure the heritage value of the surrounding Lough Neagh shoreline is protected and enhanced. The project will focus on people’s access, enjoyment and understanding of the landscape and will therefore increase people’s understanding of the industrial and natural heritage of Lough Neagh and to encourage them to connect to the water shoreline. 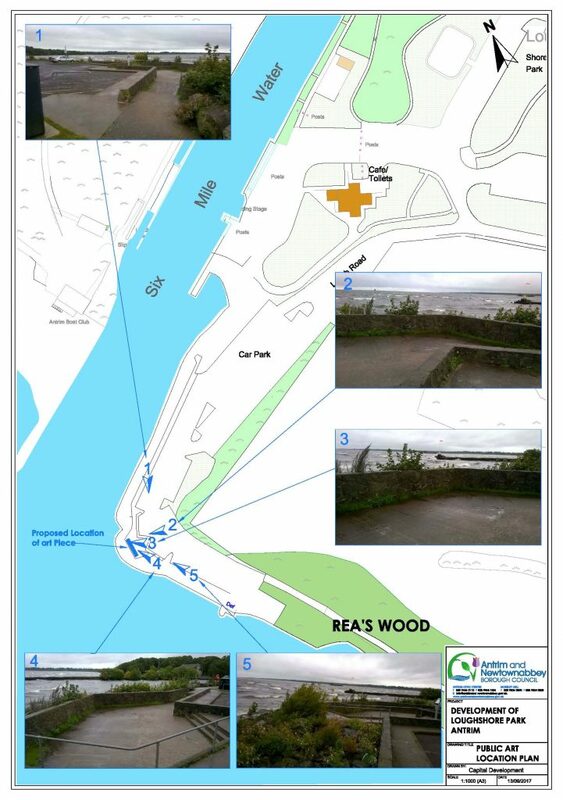 What type of sculpture would you like to see at Antrim Lough Shore Park and why? How does the sculpture relate to the folklore of Lough Neagh? 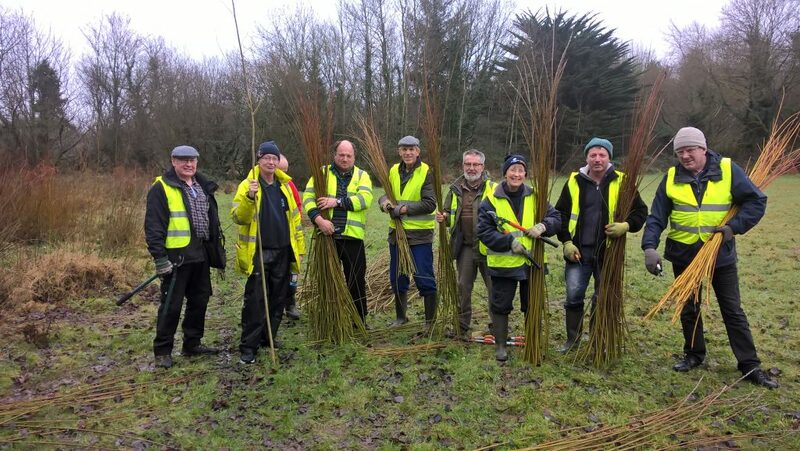 “Every year we cut the willow trees back to the stump to give us a harvest of willow rods that I can use for classes in basket-making” explained Paul Carville from Aghacommon. 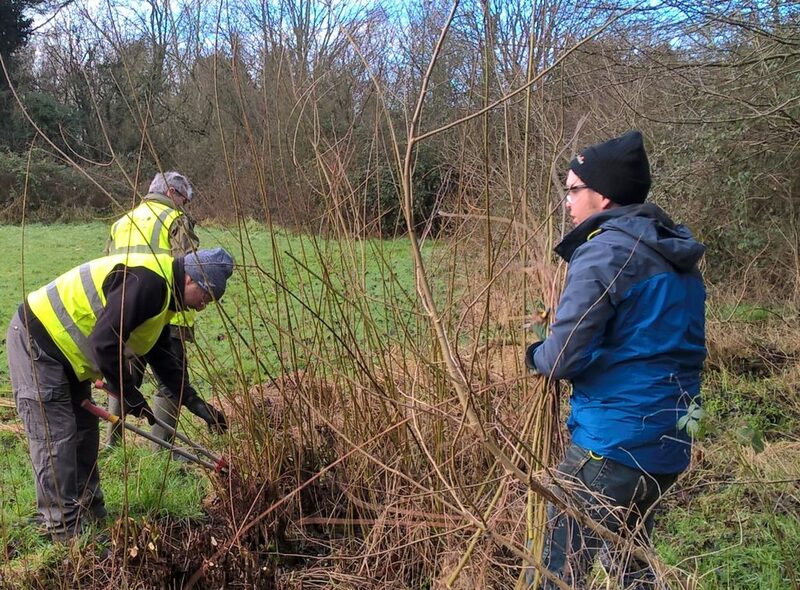 “The ancient practice of coppicing strengthens and prolongs the life of short lived trees such as willow and hazel” explained Chris McCarney, Volunteer Officer with the Lough Neagh Landscape Scheme. Hazel and willow are an important part of the landscape around Lough Neagh and provide a home for many native birds and animals. Come along and join us at Lough Neagh Discovery Centre, Oxford Island every Saturday at 10:30am during January and February. My name is Siobhan Thompson and I am Natural heritage project officer for Lough Neagh Partnership Ltd.
We have secured funding from the Heritage Lottery Fund to deliver the Lough Neagh Landscape Partnership Programme which aims to address the heritage needs of the Lough and its shoreline on a holistic integrated landscape basis. The Programme will deliver 27 projects that relate directly to the conservation of the Lough’s natural, cultural, and built heritage. The saving nature programme not only aims to contribute to the protection of both cultural and natural heritage landscapes but encourages partners and local communities to recognize that the future of their regions depends on finding synergies between preserving the cultural and natural values and the sustainable management of both. Communities and social groups experience place through real and imagined facets, to make sense of the world and the stories told therein. The visualisation methodology we hope to apply to the landscape, and in particular the peatlands, of southwest Lough Neagh will be used to join up the dots of the factual and imaginary that form affective networks of identities, which in turn shape local memory, sense of self, community and sense of the past. 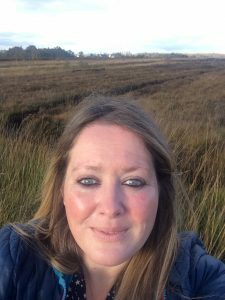 The project will bring people together to examine how our 21st century sense of place, livelihood and community has been moulded by our links to the environmental, especially processes of water and peatland. It is through these environmental connectivity’s that local actions will be linked to the natural heritage protection and conservation. This work will be delivered in conjunction with Quarto a team of four sisters from Northern Ireland. We will also be monitoring the Curlew population in the area. Curlew are one of the fastest declining birds in the UK and Breeding populations are becoming increasingly rare – with numbers decreasing in the island of Ireland by 80% in the last ten years – We have employed a team/Curlew Monitoring Officer (CMO) to monitor the breeding population on The Department of Education lands – Starting Tuesday 26th March 2019, the focus of the CMO will be to monitor the area for Breeding Curlew and engage with the local landowners/businesses to raise the profile of the Curlew within the local community. Positive outreach is an integral part of the role and this will be carried out alongside the LNLP team. We have also engaged an artist Rosalind Lowry to work in the area with different groups and we envisage strong community interest and engagement from different parties and landowners in the area – we will be keen to work with all and will hold some information nights at a number of locations in the area for locals – including Derrytresk Community Centre to let you know what is happening and when – we will advertise these on our facebook page and locally in the communities of South West Lough Neagh. This month we have started the practical conservation work on Brackagh, yes, we are back at Brackagh. 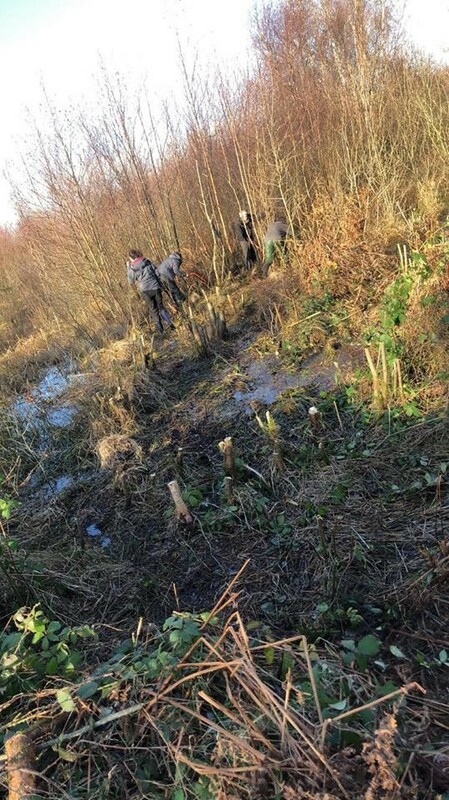 The practical conservation work we are undertaking is scrub and tree removal of the fen and pools areas within Brackagh. This involves cutting the trees with bow saws, using loppers on smaller trees, scrubs and brambles. Tree stumps are then painted with Glyphosate which is a herbicide, this then kills the tree right down to the root to prevent it from regrowing. Through this work it will help maintain the fen and prevent it from succeeding to a dense wet woodland. This is necessary as a result of the trees growing here it is drying out the soil. This then negatively impacts the wetland species which originally grew here and the insects and dragonflies which live in the vegetation. Through doing this it will prevent the fen from succeeding to a wet woodland but it will require consistent management to help prevent it from succeeding to woodland again. Today I’m going to talk about Palm Oil, something I knew very little about until recently. Palm oil has always been seen as a controversial issue, however lately it has been drawn into the spotlight after the banned Iceland ad which promoted the fact that their products are free from the oil. Demand for palm oil is growing exponentially due to the fact that it is high yielding, versatile and cheap. It uses less land to produce the same volume of vegetable oil than that of many alternatives. 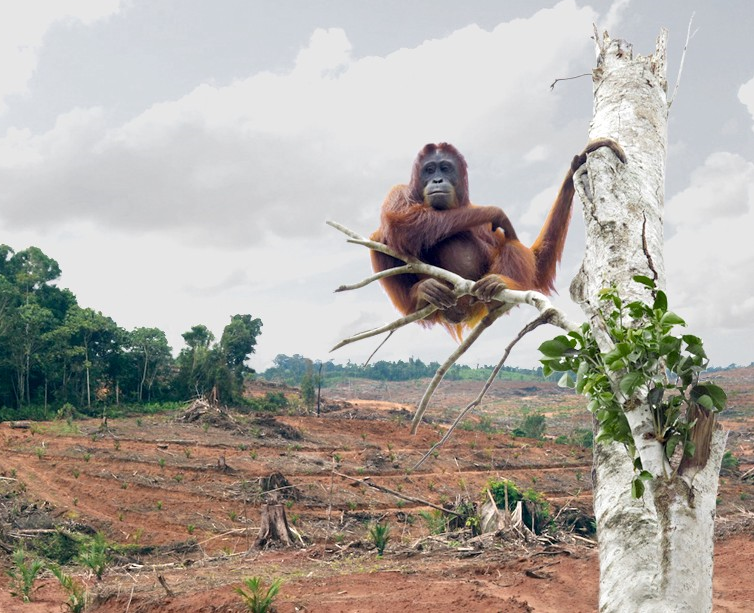 So many ask the question why do conservationists hate palm oil so much? Conservationists are not against the oil itself, but deforestation. The exponential growth in the market, is contributing directly to the continued destruction of tropical rainforests in countries like Indonesia, Malaysia and Thailand. This is having a devastating affect on the local and global ecosystem. 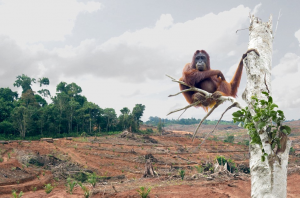 From the Iceland ad the plight of the orangutan is highlighted with 25 orangutans being killed by palm oil deforestation every day. However, the Orangutan is not the only animal endanger of becoming extinct in these tropical rainforests. Two other species that are seeing rapid declines due to palm deforestation are the Borneo Elephant and Sumatran Tiger. It is not just the animals that are suffering due to the high demand for palm oil. Tropical deforestation accounts for about 10% of total global emissions (UCS 2013). The Green House Gas emissions from palm-driven land use change is so large they are contributing significantly to global warming. It is possible to produce palm oil sustainably however currently businesses are not supporting sustainable production because consumers are not demanding it. By buying products with the RSPO logo as seen on the right, we can encourage companies to switch to sustainable palm oil. The oil is a valuable commodity that is used in many supermarket items including bread, cereal, chocolate and margarine. It is also used in many personal products like shampoo, make up, cleaning products and bio fuel. Although it is very useful product, we must be ethical consumers and question where products come from and what effect it is having on the environment. The oil can be produced in a sustainable way that can benefit the environment and the impoverished farmers in these LEDCs that rely on Palm plantations as a livelihood. But for organisations like the RSPO to make a real difference, consumers must step up like they did for fair trade, and support the production of sustainable Palm oil. 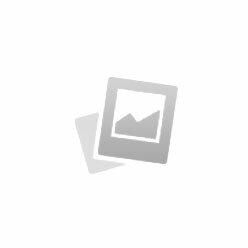 I have attached a link to the Iceland ad and a link to a website on how to avoid products with Palm Oil. I hope you enjoyed this post and will try and support companies and brands that support sustainable palm oil production! Hey guys its Nicole finally. Since my last post my placement group and I attended a training day at Portmore Lough on the Marsh Fritillary butterfly. This course was given by Rose Cremin, an Invertebrate Field officer with the Butterfly Conservation Trust. The purpose of this course was to educate us on the marsh frit butterfly, its life cycle and how to carry out larval web surveys correctly. On this course we had the opportunity to participate in a larval web survey at Montiagh’s Moss. This course was very useful and has led me to look more closely at the Marsh Fritillary Butterfly. 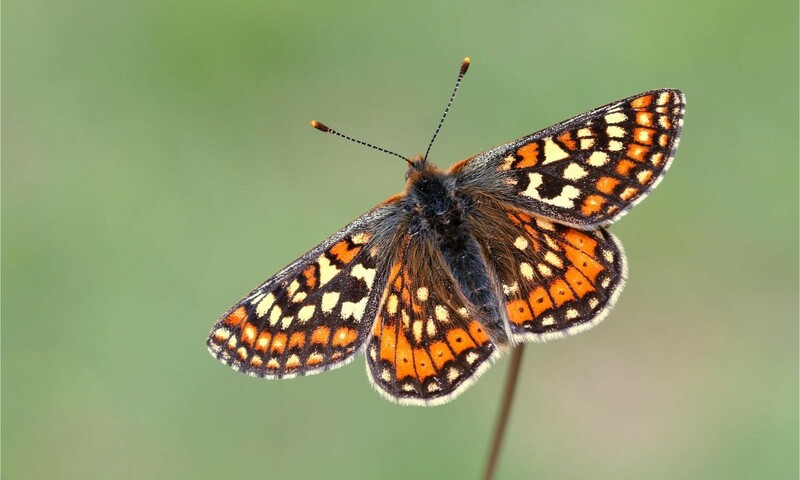 The Marsh Fritillary butterfly is a threatened species across the UK and Europe and is the object to much of conservation effort. 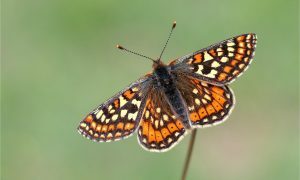 Once widespread across the Britain and Ireland the Marsh Fritillary Butterfly has severely declined over the 20th century. 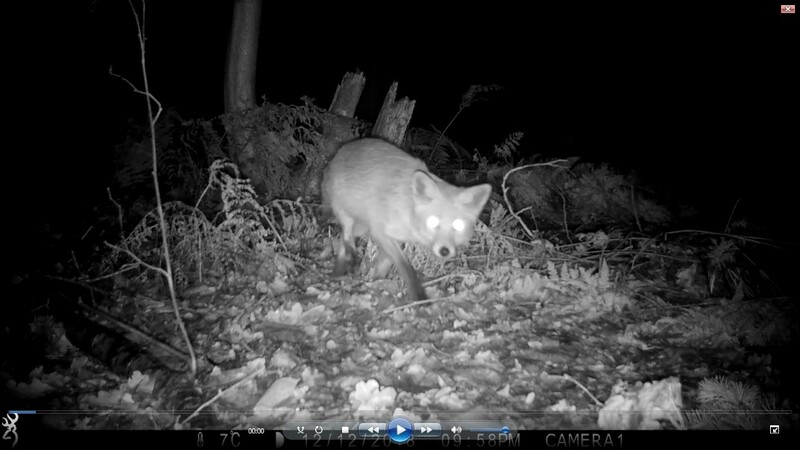 This species is highly volatile and requires an extensive habitat or habitat networks to ensure its long-term survival. This species is confined to the western side of both Britain and Ireland. As seen from the image below this butterfly has brightly patterned wings that span between 42 to 48 mm. The species of this butterfly found in Scotland and Ireland are much more heavily marked. The marsh fritillary spins conspicuous webs for their larvae which can be recorded easily in late summer. There are three main habitat types that the marsh fritillary can successful reproduce: damp grasslands that are dominated mainly by tussock forming grasses, chalk grasslands (on west or south-facing slopes in England) and shorter coastal grasslands (in Northern Ireland, Wales and Scotland). Their main foodplant is the Devils Bit Scabious (Succisa pratensis), the marsh fritillary butterfly will spin their conspicuous webs on the lower leaves of this plant. However, in a calcareous grassland, it will occasionally use either the FieldScabious (Knautia arvensis) or the Small Scabious (Scabiosa columbaria). Below is a diagram of the lifecycle of a marsh fritillary butterfly. A marsh fritillary butterfly will lay large batches of up to 350 eggs, these larvae are then spun into a protective web that will become conspicuous by the end of August. The larvae then overwinter in a small web close to the ground, usually in a dense grass tussock. In early spring the larvae will emerge. These larvae can be seen in clusters of up to 150 small black larvae when they bask in the weak sun. The larvae will then become solitary and dispense widely across the breeding habitat. Pupae form deep within grass tussocks or amongst dead leaves. The adult will then emerge in late May/early June. In the weeks after the course we carried out a marsh fritillary larval web survey at Brackagh Moss with one of the experts from the course Stephen Craig. We were unsuccessful in finding any webs on this visit and have concluded that Brackagh Moss was not an ideal site for Marsh Fritillary despite previous sightings of it in one of the surrounding fields. Hi guys it still isn’t Nicole, its Sarah (as the title might suggest). 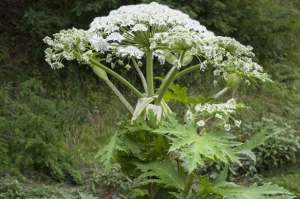 Today I’m going to write about Giant Hogweed (Heracleum mantegazzianum), no not that village in Harry Potter but an invasive plant. To be fair it would be handy if we had a magic spell to get rid of it. Like I said it is an invasive species, it can grow to over 3 metres in height, which is the equivalent to two of me. It is a close relative to Cows Parsley, but they have thick bristly stems with purple blotches. It has white flowers in umbels, this means the flowers split into individual stems which forms the cluster of flowers. Also, the leaves are jagged, lobed leaves in a rosette. The reason why people are so keen to eradicate this plant is because it can be very harmful to the touch. This is caused by the sap coming into contact with the skin, which results in severe burns in the presence of sunlight (a bit like Amy). Chemicals in the sap can cause photodermatitis or photosensitivity, which is not when you don’t look good in photos, but it is when the skin becomes very sensitive to sunlight and may suffer blistering, pigmentation and long-lasting scars. Needless to say, this is one plant you don’t want to pick when out for a stroll. 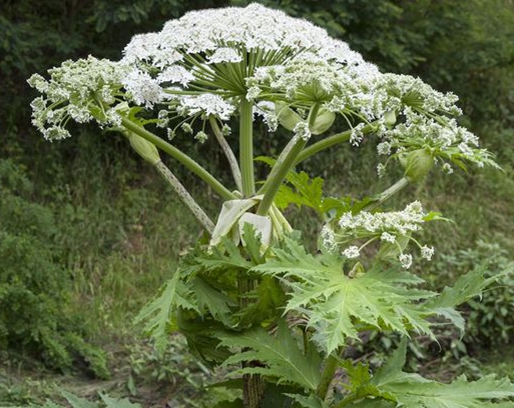 When controlling Giant Hogweed always wear gloves, cover your arms and legs, and ideally wear a face mask when working on or near it. Cut plant debris, contaminated clothing and tools are potentially hazardous too. Wash any skin that comes in contact with the plant immediately. Ensure that contractors working on your land are aware of the risks and competent to deal with this weed. I strongly suggest consulting your local environmental authority about how best to deal with Giant Hogweed before removing it. To end the moral of this blog is don’t jump into Giants Hogweed even when your friends tell you it’s not worth the tan lines.